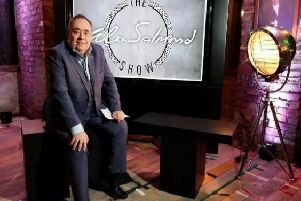 AN UNOFFICIAL cross-party alliance to stop Alex Salmond’s campaign to become an MP in Gordon has been unveiled by the Lib Dems as SNP activists warn that the former first minister faces a “close” fight to win the Aberdeenshire seat. Lib Dem candidate Christine Jardine has been publicly endorsed by Labour and Tory party members as well as a former Yes voter from last year as she became the focal point of a coalition to stop Mr Salmond to return to Westminster. The development came as Mr Salmond claimed in an interview over the weekend that the SNP would ‘hammer’ the Lib Dems in the contest. The Electoral Reform Society has also identified the seat as being marginal, suggesting the race may be close. The cross-party event in Inverurie saw Labour’s George Simpson, Conservative Lachland Rhodes and Yes supporter Jen Wilson join Ms Jardine to confirm they will be voting for her on 7 May. Lachland Rhodes, from Clatt, said: “I have been a Tory voter all my life, but here in Gordon the potential for Alex Salmond to win this seat for the SNP is such that a vote for the Liberal Democrats is imperative to keep him out of Westminster. Mr Simpson of Tarves said: “I’ve always voted Labour, and I have not changed my view on that. But this election is going to be close. Its a straight choice and I’ll be voting for Christine because I want her as my MP and not Alex Salmond. Yes voter Ms Wilson, from Inverurie, raised concerns over Mr Salmond’s record on public services in the north east as First Minister. She said: “I voted Yes in the referendum but I believe Christine will be the best MP for Gordon. She cares about people more than anything else and will work hard for us for the next 5 years.